Do NOT skip Part II, because most of real/traditional cumbia loops are inside Raza Takeover. 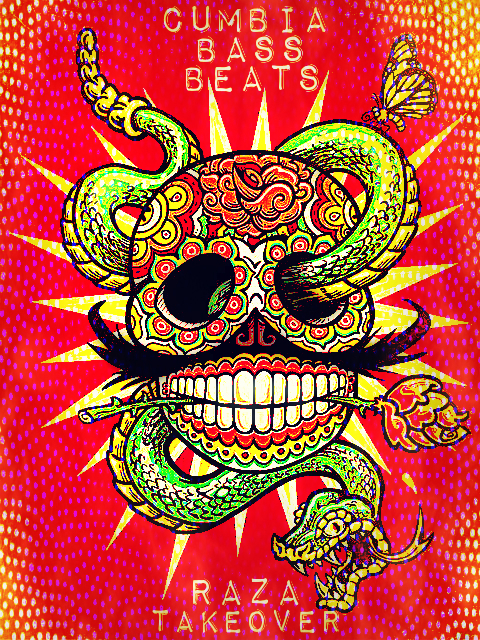 All Cumbia Bass beats tracks have been carefully crafted and wherever possible, the samples have been tested in Ableton, Logic Pro, Acid Pro, FL studio and most of them were well mastered allowing us producers to maximize the sonic palette for cumbia. Most of the loops are sample-accurate which allows total flexibility to mix & layer together any combination of sounds which helps facilitate endless sonic fusions. In Fact the result is so awesome that we decided to do a showcase with just a very small portion of the samples and adding our own styles.. This particular showcase has only 8 sounds combined in different ways and speed to create any Style that can fit from Traditional, to Digital Cumbia, Moombahton or dubstep inspired cumbia or Tropical Bass or even 3Ball, Twerk or Zouk Bass with some Cumbia Flavor. Raza Takeover has loops from Global bass heads such as Dengue-Dengue-Dengue, Caballo, Bleepolar, Dj Tamalero, Banginclude, Bubbleheads,as well as some great sound engineers/instructors like Mike Bruce, from the Beat Making Lab. Cumbia Bass Beats II will be given for free and actually it has different dynamics to reflect today’s musical fast changing environment. The whole compilation will be divided in Cumbia Bass Beats II and CBB Raza Take Over. The first one will have cumbia loops that can fit into Moombahton, Dubstep, Twerk, Zouk Bass, 3Ball, Champeta or Plain Cumbia. Raza Takeover will have more organic loops that can fit any style, but if you are a more skilled or like more traditional cumbia loops, then DO NOT SKIP vol 2. Even if you do not make cumbia and to show it in a real context, let`s have a look to another showcase of CUMBIA BASS BEATS vol 2: Raza Takeover. This song has been created using the loops in the library plus a synth from Corrupted Data’s twerk it track. in order to show the sonic availability of the library plus any creative idea.